A last call is being made to send emails to county councillors who will make a decision tomorrow (March 22) on whether or not to refer a decision over acute stroke units back to government. 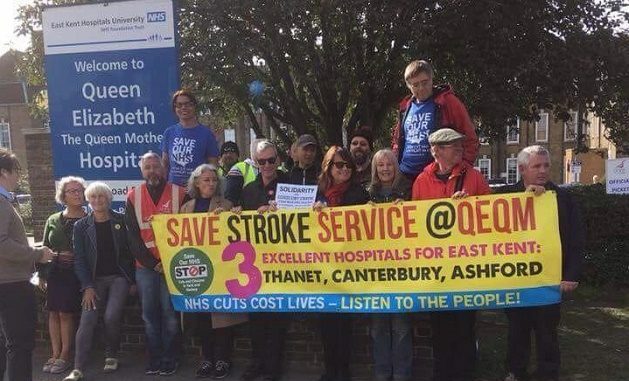 If referred back the Kent and Medway NHS plans to implement three hyper-acute stroke units across the region, meaning the closure of existing acute units at hospitals including Margate’s QEQM, will be on hold and could be subject to a full review. Acute stroke services are provided in all the hospitals across Kent and Medway, including the QEQM, but there are currently no specialist hyper acute units. NHS bosses in the region say larger, specialist units in other parts of the country have been shown to improve outcomes for people who have had a stroke. Residents have been writing letters to the county members of the health scrutiny panel which will be making the decision. Those appealing for the decision to be referred include church-goers at St Luke’s in Ramsgate. Students at King Ethelbert school in Birchington are also emailing family and friends as part of their Citizenship coursework, to make sure everyone they know is alerted to the situation. Around 100 letters and emails have been sent so far. Residents have until 10am tomorrow to contact the panel about the decision. Campaign group Save Our NHS in Kent will be holding two simultaneous protests this Friday in Margate and Maidstone. Keep those letters coming in please! I shall pass each and everyone on to the NHS for individual responses. You deserve nothing less! We will stop this terrible decision. I would very much like the County Health Panel to refer the controversial Stroke Unit decision back to Government. This is so very important. Please. You need to write to is John. I’m collating all the letters and will use them to ensure Thanet residents are properly listened to and are heard. I have written to all the councillors on the HOSC and several have responded saying they take on board our concerns as residents of Thanet who face a journey of at least an hour if Ashford is the nearest HASU to us. We can’t just let this happen – write to the county councillors above straight away! The vote is tomorrow! The meeting starts at 10am, so if you want to take action, send an email to all of the names in the list tonight! Tell them 3 HASUs aren’t enough for all of Kent. Tell them that mortality rises by 21% when journeys to emergency care go over 40-50 minutes. If you want some hard facts to put in your email, take a look at the Save Our NHS in Kent report, here: https://bit.ly/2Fb5R1b. Please also bear in mind that Peter Lake is away, but Cllr Ros Binks is standing in for him. Every minute in which a large vessel ischemic stroke is untreated, the average patient loses 1.9 million neurons, 13.8 billion synapses, and 12 km (7 miles) of axonal fibers. Each hour in which treatment fails to occur, the brain loses as many neuron as it does in almost 3.6 years of normal aging. That means getting treatment is a priority as near as possible. QEQM is the nearest hospital that deals with Stroke patients in and around Thanet currently. It is so important that early treatment makes a huge difference, it always has been, not what we are being told by those cost saving managers and directors as previously reported, not those who want to strip Thanet. Please don’t sit back and do nothing. If you are reading this please email the cllrs now. Email address links are above.